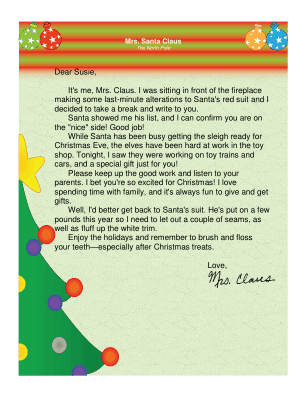 This printable letter is from Santa's wife, Mrs. Claus, and lets the child know he or she is on the Nice List. It's me, Mrs. Claus. I was sitting in front of the fireplace making some last-minute alterations to Santa's red suit and I decided to take a break and write to you. Santa showed me his list, and I can confirm you are on the "nice" side! Good job! While Santa has been busy getting the sleigh ready for Christmas Eve, the elves have been hard at work in the toy shop. Tonight, I saw they were working on toy trains and cars, and a special gift just for you! Please keep up the good work and listen to your parents. I bet you're so excited for Christmas! I love spending time with family, and it's always fun to give and get gifts. Well, I'd better get back to Santa's suit. He's put on a few pounds this year so I need to let out a couple of seams, as well as fluff up the white trim. Enjoy the holidays and remember to brush and floss your teeth-especially after Christmas treats.